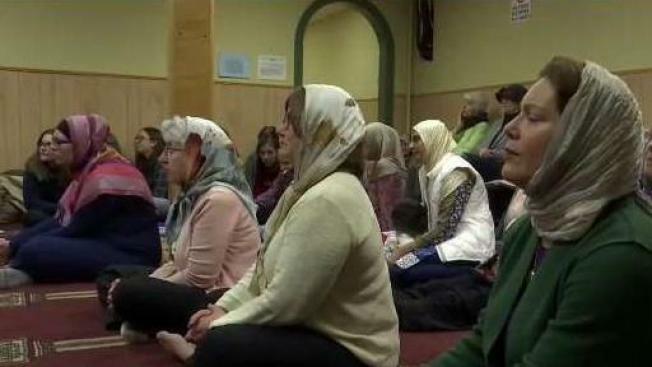 Following last month's gun massacre at two New Zealand mosques, a prayer service at a Vermont mosque Friday aimed to unite people of different faiths. A prayer service at a Vermont mosque Friday aimed to reach across what can often seem like cultural boundaries. “I think it says something about hope,” Dexter Mahaffey of Vermont Commons School, one of the guests at the gathering, said about the inclusivity of the service. The Islamic Society of Vermont welcomed members of Burlington’s Ohavi Zedek Synagogue and eighth graders from South Burlington’s Vermont Commons School into its Friday afternoon prayers, reminding them Islam is a religion of peace. The service saw Muslims, Jews, Christians, and people with other beliefs coming together with common goals of gaining cultural awareness, understanding, new connections, and friendship. The visits followed last month’s gun massacre at two New Zealand mosques, in what police there labelled a terrorist act. Fifty murder charges and more than three-dozen attempted murder charges have been filed against the suspect–an apparent white supremacist. Back home, the Islamic Society of Vermont said it really felt embraced after the attacks, by a flood of cards, emails, and flowers from neighbors, including from a nearby Congregational Church. “We are a part of this community,” Halilovic said, adding that he’s proud the center has bonds with so many from other faiths. While it was the New Zealand tragedy that inspired Rabbi Amy Small of the Ohavi Zedek Synagogue to reach out to the Islamic Society of Vermont and ask to worship in solidarity at the mosque, she promised regular meetings, meals, and other get-togethers throughout the year. “Even in our community that is progressive and forward-thinking, we always need to be engaging with each other across all sorts of potential divides, and making those not divides—but making those bridges,” Mahaffey said of the cultural learning the Vermont Commons School hopes its students gained from visiting the mosque. Mahaffey said bringing together people from diverse backgrounds under one roof, where they can engage with each other and learn from one another with open hearts and minds, is an ideal the whole country should strive for.